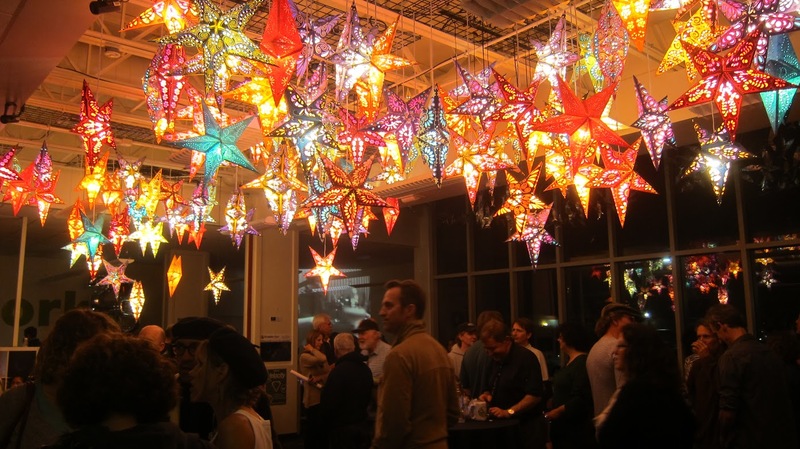 Hanging star lanterns from Om Gallery light up Cruzio’s 25th anniversary event. For those interested in Cruzio’s history, the evolution of Cruzio and technology over the past 25 years was displayed in a visual storyboard. Cruzioworks (Cruzio’s co-working space) was the place to be last Friday night with live music on the street and inside from local bands the Coffee Zombie Collective and SoundScape. A red carpet led the way inside where party-goers received glow sticks, Cruzio coffee mugs, and other fun pieces of swag. The ceiling was aglow with multi-color star lights donated by Om Gallery for the night, and pinpricks of laser lights bounced off a deep blue wall, giving the effect of a starry night. Kids gleefully wielded free light sabers while millennials and baby boomers mingled beneath the stars sipping on beer from Santa Cruz Mountain Brewery and noshing on celebratory cupcakes. To add to the fun, Cruzio set up a photo booth complete with wacky costumes next to a corner filled with retro computers and video games. 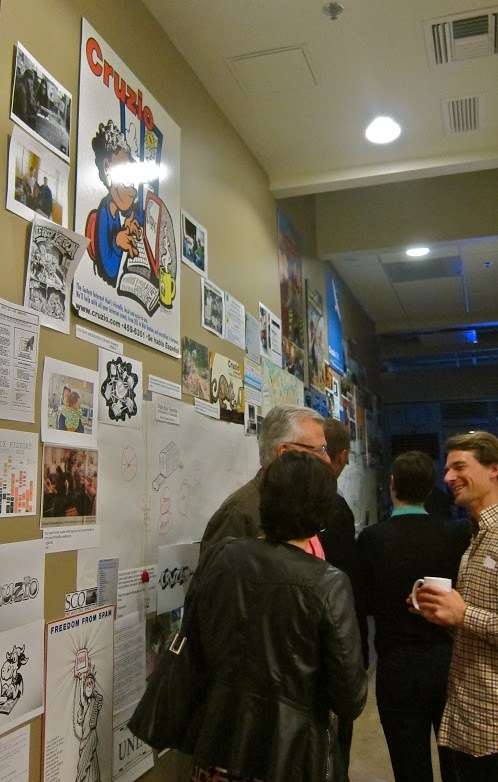 For history buffs, techies and artists, there was an exhibit showcasing the history of digital art and a wall plastered with photos depicting the evolution of Cruzio and technology in Santa Cruz over the past 25 years. The Cruzio anniversary party included some blasts to the past like this retro computer and video game corner. 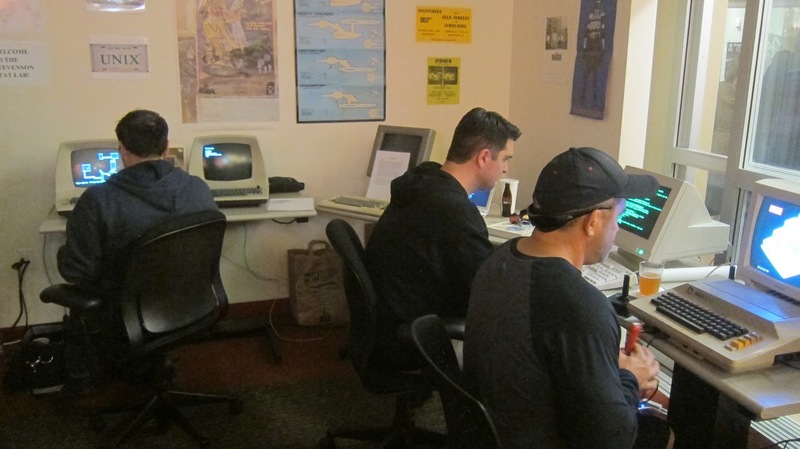 When Neklason and Dolgenos started Cruzio 25 years ago, it was one of the first internet providers in the country. Cruzio had the chance to go national but chose to stay local, a decision that helped them survive the dot-com bust and has greatly benefited the Santa Cruz community. Cruzio now employs 35 people and provides a fiber connection to 9,000 customers that’s just as fast as Comcast or AT&T but with better customer service. Cruzio has accomplished a lot over the past 25 years including, Neklason jokes, “creating total gridlock in Santa Cruz” with all the traffic generated from their anniversary event. Cruzio has big plans for the future, including connecting every house in the county to high speed internet. They have already started the process of building a fiber to the home network in Santa Cruz and recently connected 2030 N Pacific Avenue to their fiber-backed broadband network, providing residents with Internet speeds of 100 Mbps. For more news on Cruzio’s achievements and what they have in store for us in the future, watch the full Think Local First radio interview with Neklason and Dolgenos, or view the shorter video snip, Chris & Peggy on fiber to home network and the Next Big Thing.